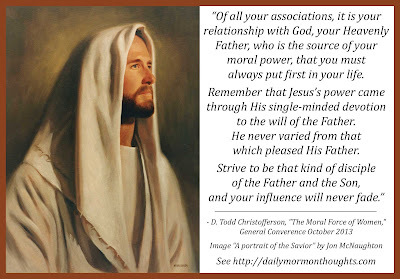 "Of all your associations, it is your relationship with God, your Heavenly Father, who is the source of your moral power, that you must always put first in your life. Remember that Jesus’s power came through His single-minded devotion to the will of the Father. He never varied from that which pleased His Father. (See John 8:29.) Strive to be that kind of disciple of the Father and the Son, and your influence will never fade. "And do not be afraid to apply that influence without fear or apology. 'Be ready always to give an answer to every [man, woman, and child] that asketh you a reason of the hope that is in you.' (1 Peter 3:15.) 'Preach the word; be instant in season, out of season; reprove, rebuke, exhort with all longsuffering and doctrine.' (2 Timothy 4:2.) 'Bring up your children in light and truth.' (D&C 93:40.) 'Teach [them] to pray, and to walk uprightly before the Lord.' (D&C 68:28.)" In this conference talk, Elder Christofferson emphasized the unique contribution of women in the history of society, describing their "innate moral power" and encouraging them to further cultivate that gift, while also reminding the brethren that they have similar obligations to seek for goodness in their lives. One of the keys to strengthening our "moral power" and influence in society is to focus on our relationship with God. As our discipleship and devotion to Him increase, so will our moral power and influence for good in society. But then the key is to let that influence be felt. Elder Christofferson encourages us, through several scriptural exhortations, to speak up and let our voices be heard.